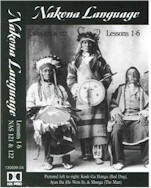 There are a total of sixteen (16) Nakona Language Lessons in the full text version. There are also three (3) cassette tapes, that accompany the text. These items can be purchased at Fort Peck Community College for $75.00 US currency only. These language courses are designed for students with little or no Nakona speaking ability. Classroom pronunciation drills, basic sentence structure, vocabulary acquisition and grammatical usage will be used to develop student proficiency in the Nakona Language. Some cultural and historical detail of the Nakona people will be included.